The Markets continued to post fresh lifetime highs and ended the day with gains for fifth day in a row while remaining in “overbought” zone. The Markets saw a flat opening but posted some modest gains in the morning trade. Markets pared these gains as it came off and dipped very modestly into the red for a very brief period while forming the day’s low of 8825.45 in the late morning trade. Until afternoon the Markets saw a very narrow and capped movement as it spent the first half of the session in sideways trajectory. The second half of the session saw a sharp rise in the Markets. It saw almost parabolic upside as liquidity continued to chase the Markets. It went on to form the fresh lifetime high of 8925.05 in the later part of the session. These gains were maintained and the Markets finally ended the day at 8910.50, posting a decent gain of 74.90 points or 0.85% while forming a higher top and higher bottom on the Daily Bar Charts. The Markets have continued to demonstrate high liquidity driven chase and we can expect this buoyant trend to continue. However, with the existing structure of the Chart, we cannot rule out modestly negative to flat opening to the session. Even if we get a positive opening, some amount of consolidation has become imminent in the Markets. With each higher level, it enforces more caution into the air. Further, while we enter into penultimate day of expiry of current series, rollovers would dominate the session as well. 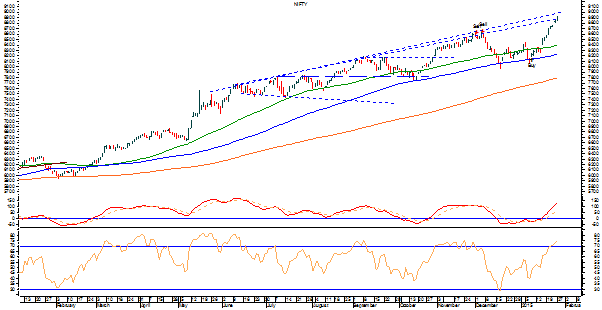 The levels of 8930 and 8975 would act as immediate resistance for the Markets. The downside supports come in much lower at 8790 and 8725 levels. The RSI—Relative Strength Index on the Daily Chart is 75.6375 and it has reached its highest value in last 14-dayw which is bullish. It does not show any bullish or bearish divergence but it continues to trade in “overbought” zone. The Daily MACD continues to remain bullish while trading above its signal line. On the derivative front, the NIFTY January series have shed over 66.73 lakh shares in Open Interest while February series have added over 87.56 lakh shares or over 268.24% in Open Interest. These figures are due to rollovers and total OI shows addition which continue to point out creation of long positions in the Markets. Coming to pattern analysis, the Markets have attempted to move past one of the upper rising trend line. Another one exist at 8975 and this is a major resistance going by the structure of the Charts. This may cause greater resistance simply because of the fact that it is longer term trend line and the Markets have resisted this in last couple of months. Further to this, the Markets have risen over 845-odd points from the intraday lows it formed earlier this month. Coupled with the fact that it now trades clearly “overbought” it certainly cautions us in the immediate short term. Overall, even if the overall up trend remains intact, a mild profit taking from higher levels or consolidation just cannot be ruled out. There are high chances that in case of any higher opening or any intraday up move, some amount of consolidation remains imminent. Keeping this in view, it is strongly suggested to refrain from making fresh purchases and remain highly selective for fresh longs. More importantly, all existing profits should be very vigilantly protected at higher levels. Overall, high degree of caution is advised for the day.